New tank setup for yellow shrimps. Oh my!! Erm i hope my dogs did not eat them?? Yep they have a cover on there. And its a fitted cover, gotta unlatch from the hinges before you can remove it entirely. Well, im sure they will pop out somewhere. Just really puzzled where did they go unless they went cannibalistic and ate each other. (They are fed very well) so im guessing no they would not do that. The tank is really clean, so im really curious where they went. Am just playing around with the thought of having a small tank setup for them but that is just more work..
That is a mystery then, maybe they are hiding somewhere. If you have snails in with them then they will eat the dead bodies? Hope you see them swimming around soon. I don't think they will turn to eating each other, even a dead one?? I wouldn't worry too much about putting them in with the neons, I have had red cherrys in with my neons for years, there is such a small chance of them getting eaten that it isn't really worth setting up a special tank! You would probably not transfer them as newborns either as you need to give them time to be sure of the colour etc. They will be happier in the bigger fish tank as well! Will look around for the 3 missing neons. It is not a big tank, really a mystery where they went. Just one quick last thought on putting the culls in the tetra tank. You probably haven't witnessed it yet if you haven't kept them with fish but they can dart across a tank like nothing else I have seen if they want or need to (backwards so I guess its a flick of the tail), way way quicker than a neon can swim - it has to be seen to be believed.................... though in reality you can't even see it as it is so fast! Wow that will be interesting to watch im sure! Its a good sunday afternoon! 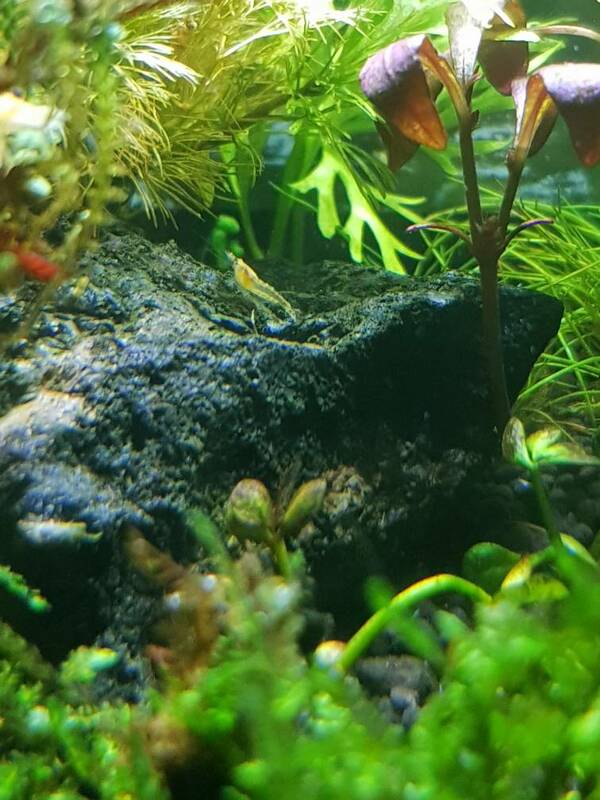 Spotted one baby shrimp that was saved earlier, wonder where the other 14 went. Great news, the others will be hiding in there somewhere as would be their instinct, but always good to see one occasionally popping out! Woke up this morning to a berried female! This will be my first berried female happening due to stable tank conditions! The previous pregnancies were all because i happen to buy shrimps that were already berried! Here is thanking all of you for guiding me along with your lessons and teachings. I am so happy! It has been quite a journey from multiple shrimp deaths to now a berried female! Many more berried shrimps to come, I'm sure. Fantastic news, you are well on your way now! Thanks guys i cant be happier! Did a water change today and saw this little guy! This was one of the baby shrimps that was hatched artifically awhile ago! This guy has grown and putting on some colour! Just thought of sharing the joy with everyone! Growing babies are good news! 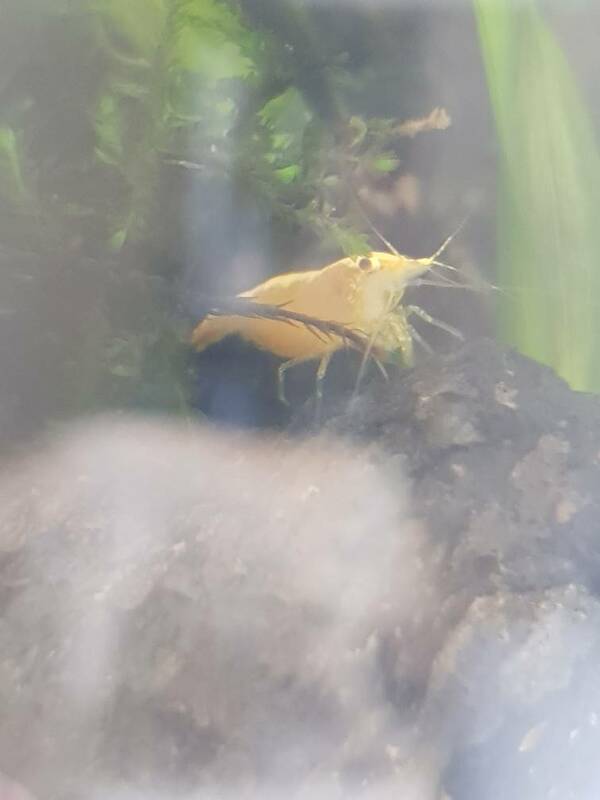 Mama shrimp is as well doing good! Have a happy saturday everyone! Great to see the progression in your tank. Agreed! Happy days are here! !